We're going to need to create names and a bit of fluff for the new regions we want to add to the world map. As we think of them, we can write them down here. Feel free to disagree on any of them. Those are excellent additions, though I disagree with four of them: The Grand Exchange, The Cook's guild, Falador Castle and the Castle Drakan. The Grand Exchange is a single building that's part of Varrock. It's very, very unlikely the Grand Exchange would function if its controller didn't also own the city of Varrock itself. The same goes for the rest of those. Cook's Guild also wouldn't add anything to the game. I was thinking those four wouldn't go over well. Haha. Now which do you guys think will be landmarks?~ Or have I not read that far yet and we're not doing landmarks? I was thinking that, overall, we'd have way more regions, splitting up most of the existing ones, like Falador, into much smaller ones. Well, we aren't going to have gazillions of regions, but I can see having half again as many. Of course, we can't split the cities themselves, but we can have Falador city and then the area outside the walls split up to more regions. Well, remember, the Cities are quite small compared to the regions. Maybe we'll have Falador Actual, North Falador, West Falador, East Falador, and only Falador Actual being the advanced region, but North, West, East, etc. being categorized as settled. 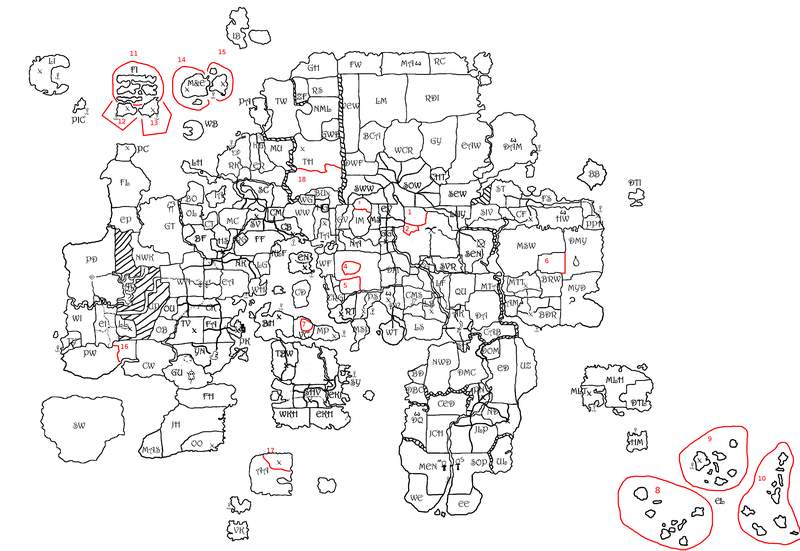 Well, first I think we should fix a few misconception you have about the map of God Wars forum game. If you take a look at Yuccon's map and look at Varrock, the city of Varrock is the size of the symbol it has on the map, and is located where the symbol is. And like I said, we can't split up cities into multiple regions. I actually wanted to do more. if the symbols and letters dont fit in the new regions, then why not make the (picture of the) map bigger? It's not the size of the regions that's the issue, it's the number. Too many regions is just too many, since with the number of regions going up, so does the distance between locations. Like the distance between the Zarosian empire and the Nardans grows with Lime's version at least threefold. And now with the implementation of caravans that makes resource trading pretty much impossible. I don't think it's a good idea increasing speed to ridiculous numbers just for the sake of it. What's the point of owning regions when your army can go through 5 regions in a single season? The fact that there is like 500 regions. Alright, let's say you send an army 10 regions away. This takes you 2 seasons. now, let's say you send an army merely 1 region away. This takes 1/5 of a season, so by all logic, it would arrive before the turn end would even happen. Instantaneous short-range mass-movement is overpowered. Or, we could rework how roads work, or how fast Caravans move in comparison to Armies. And how do you justify rounding up? I can see it with going through two regions at once, as halves always round up, but less than half has no such justification. And how do you justify a caravan zipping through five times as many regions as an army? Armies aren't that slow, nor do caravans have airplanes. When distance grows, the downsides outweigh the positives. Not to mention that when regions become more numerous, you need to either have much, much smaller modifiers, meaning regions on their own don't mean crap, or accept the fact that people can collect effective 200,000 resource later on. So, Varrock wouldn't be split up into Varrock West, Varrock East, etc. It'd be more like Varrock itself, surrounded by regions that aren't well-represented in-game. For instance, a small hamlet to the west called Westborough (which would be a Settled region), or Varrock Fields to the south (Wild). 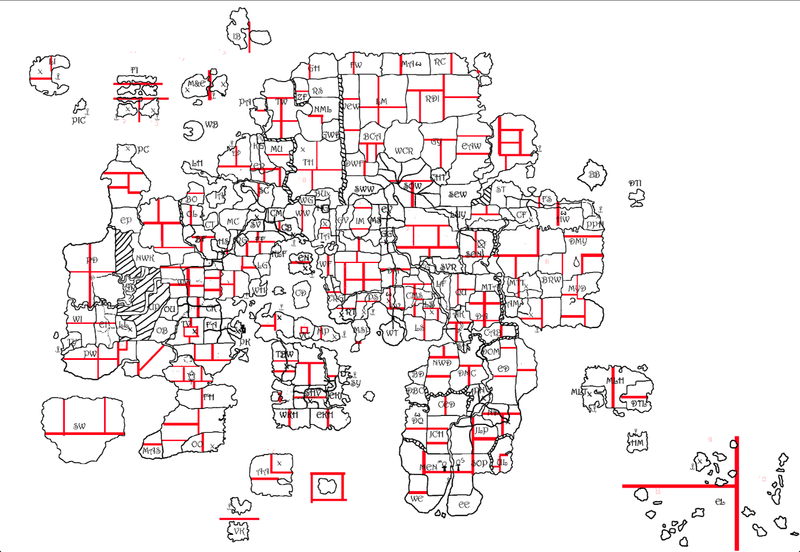 Additionally, we might invent some new "buffer regions", like Gunnarsgrass, a Wild region between Edgeville and Gunnarsgrunn, without chopping up larger preexisting regions (though we'll do that, too). The goal is 20-40% more regions. Armies take time to set up camp. Caravans do not need as much time. In comparison to the Caravan, Armies are around 10x slower back in the day, IMO. Firstly, most armies aren't entirely on horseback/wheels. Additionally, Caravans carry around heavy things with Carts, Wagons, and Mules, while Armies need to mostly place it right on their soldiers' backs. This makes armies much slower. Additionally, as distance grows, it makes more sense to place a Mass Teleport Lodestone every so often. I assumed that the resources for each area would be much smaller, in some areas possibly nonexistent, just there for the gold collection. However, this would be balanced by each region being much easier to capture, unless the resource modifiers are severe, so it'd be much easier to capture loads of small territories. So, essentially, it's just another naming issue. I see the mechanics we essentially agree on, it's just what we call it all. In My opinion, it's like calling Quebec. There is a Quebec City, there's a Quebec Territory. Quebec Territory has a bunch of tiny cites and towns all across, but Quebec City is one city inside, tiny in comparison to the actual territory. Just replace all the times I said "Quebec" with "Varrock" and that's basically the example. Right, but when people say Quebec (or how about New York? ), they usually mean the city itself, not the territory/state. Therefore, we can't name Westborough "Varrock West" because people will assume the city itself is split up.